name. Thanks to my late mother, I’ve seen this film at least fifteen times. 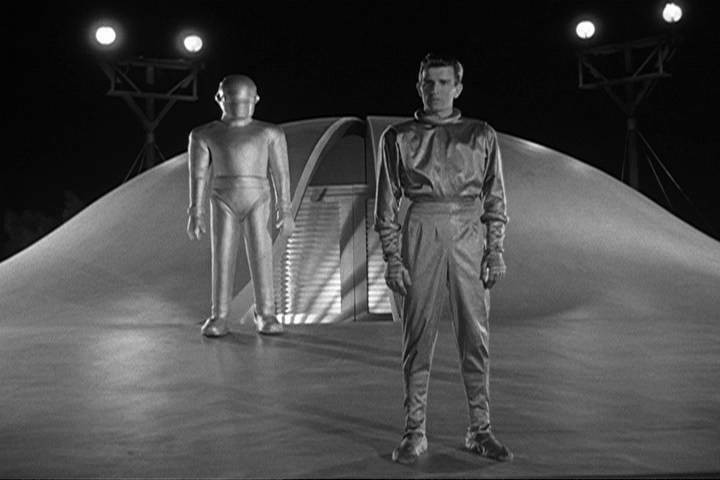 I was raised on “One Step Beyond” “Outer Limits” and the “Twilight Zone.” However, “The Day the Earth Stood Still” was a perennial favorite. I admit that what the film loses in being hokey, it makes up in getting us to think about humanity’s capacity for violence. Seen through the lens of Easter, I am reminded of how the plot parallels certain religious themes. In the film, an alien visitor appears in human form, landing on Earth to walk among us with the goal of delivering an important message to the citizens of earth. “Klaatu” tells them that the message he bears is so momentous it must be revealed to all the world’s leaders simultaneously. However, before he can deliver this message, he is killed by mob violence and resurrected temporarily to complete his mission. When asked if his technology holds the power of life and death, he tells them that only the almighty spirit has that power. When the people fail to take his request seriously, he causes the world to stand still for one hour. Cars and trains mysteriously stop and nothing but planes already in flight continues. When Klaatu ultimately does address the world’s scientists, he tells them that our penchant for violence has gained the attention of the universe and because we are beginning to venture into space, the other planets will not allow our violence to extend beyond our borders. He then leaves behind a robot programmed to maintain the peace, or to reduce us to a burned out cinder if we do not comply. And now it’s no longer 1st century Palestine, or 1951 Hollywood. It’s Minnesota, U.S.A., Earth, Easter Sunday 2014. We live in a world where violence for violence sake is all too common. Today our capacity for violence spans the distance between class room bullying and weapons of mass destruction. That said, that the gravity of our response is more important than at any other time in history. No, Jesus did not leave us a robot to wipe us out if we got it wrong. He left us the Holy Spirit, to whisper and to guide his community. Christ came to show us who God truly is. The God who placed a rainbow covenant in the sky, placed it as a promise to never again solve the problem of violence by inflicting more violence. That is the God we meet in Christ. The message of Easter today is centered in God’s radical hope of a “new covenant in his blood”—a world order defined by love, peacemaking, care of neighbor, justice, and equality. On the day the earth stood still, Jesus put death to death and his resurrection changed everything from that day forward. So what will be our response to Gods radical, boundary-breaking acts of divine love that are at the heart of Easter? It is my prayer that we will answer the call to live our life so that one day, the lion will lay down with the lamb. THAT is Christ’s ongoing work in, with, and through us. That is Easter hope, a hope that will only be called science fiction if we fail.